Talk through exchanges and offensive actions. Discourage the offense with loud communication. Stay engaged the entire play with communication. Be willing to communicate regardless of position or personality. Players 1-14 must be held to the same standard. Great communication needs to be rewarded. Call out specific things that will help teammates out. Everyone needs to be on the same page when it comes to guarding different actions. This will help to eliminate defensive breakdowns and confusion. Guard: dig down, double, stay home, lob help on the back side if it is a full front. Post: sit behind, front, 3/4 front, 1/4 front. Get hands in passing lanes and deflect the ball. Make the defense throw the ball over top of the defense. This is essential for allowing the weak side defender to close out on the catch. Close out with high hands and contest every shot. Be there on the catch. Move to closeout as soon as the ball leaves the passers hands. Don't leave early. If you do, it will open you up to pass fakes. Chop your feet and stay connected to the ground as much as possible. Be in position to slide and take away the drive without using your hands. No middle penetration. Aim the driver to the baseline. See the ball and the man when guarding cutters. Don't allow the offensive player to get a deep catch on the block. Fight for position before the ball is entered, and drive the offensive player further out to receive the catch. Easy offensive looks for other team. Builds distrust within the defense. Stay in an athletic stance so that you can react quickly as the ball moves. When the ball moves, you move. Know where you should be. and what you should be doing at all times. Every player must do their job when the shot goes up. First to the floor every time. Must be willing to step up and sacrifice your body for the team. Stay in great help position, anticipate the offense, and then get set for the charge. Mindset needs to be first to the floor. Don't be too cool to get dirty. Run over and help your teammate up after they take a charge, dive for the ball, etc. GET EXCITED!! Fight through mistakes and get the job done regardless of what happened. Communicate at a high level to get through it. Want it more than the offense. Make a play. Big time players and big time teams make a play when it is needed. Must compete on every play. Hold teammates accountable in a constructive way. All 5 players must work together to keep the ball out of the paint. Player on the ball needs to trust that he/she has teammates helping them. Pressure the ball without giving up penetration. Make it hard for the point guard to run offense. Players in the gap must be ready to help if the ball handler gets an angle. Players in the help must help the helper. Everyone needs to be ready to rotate if needed. The entire defense must work as one unit if there is a breakdown. First 3 steps need to be a full on sprint, then get your head up. Don't hang back with your man or stay at the level of the ball. One player needs to be communicating that they are stopping the ball. Try to turn the ball handler 2-3 times. Doesn't have to be your man, just match up. What actions do they like to run? Don't allow the offense to dictate what they want to do. 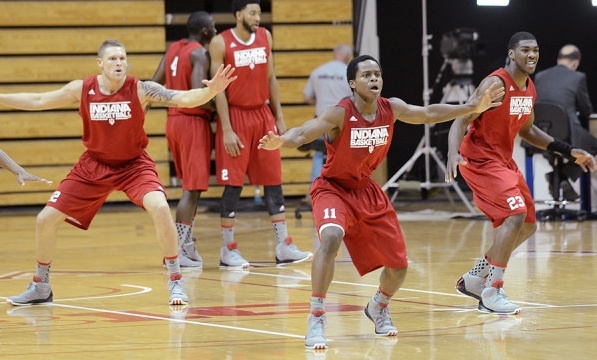 Players need to be fully committed to the defensive game plan. Don't try to do your own thing, trust the plan. Championship teams play defense, it is as simple as that. There are great offensive teams that can make runs, but if you are not able to get big stops at the end of close games your season will end shorter than you would like. Defense is not something that appears over night either. It is something that takes time and must be built up and established on a daily basis. As a coach you must be willing to spend the time doing defensive basketball drills, holding players accountable, and preaching defense on a regular basis. You must be fully committed to the defensive process. Regardless of what type of defense you play, these keys will apply to your team because they translate from scheme to scheme. There are ten keys listed above, but the one that blankets all of them, is buy in. Great defensive teams are bought into the system, and to what it takes to play defense at a high level. It is not easy to build this defensive foundation, but if you stay committed to the process it will be more than worth it in the end. If you have any defensive tips or advice feel free to share below. Also, if you have any questions, we will do our best to answer them! The long answer: If you can’t remember all 10, which are the important ones that would still allow a team to be good defensively and how do you pick them? Lastly if a coach isn’t hammering on these in defensive drills, he’s doing his team a huge disservice. Just my opinion so I could be wrong but I doubt it. Absolutely right Brian. The goal is to learn/master them all, but it takes time and commitment. It isn’t an overnight process. How many ways do we have to defende pick and roll ..
defense starts from us, the coaches. its a commitment, in other words, a daily grind, drills and execution. not just mere shouting ‘ defense’ words during actual games.